Hi. My name is Garret and I have a problem. Truthfully and thankfully, my addiction is not alcohol, medication, or other more serious concerns that medical professionals face. I am addicted to adrenaline, lack of sleep, and caffeine. My addiction to caffeine started when I was in college. If you are telling me you never were tempted by caffeine in college, then you have the will power of Clark Kent not telling Lois Lane that he is "the man." For me, college was the start. Early mornings in the gym, classes all day long, baseball in the afternoon, and then burning the midnight oil trying to not fail organic chemistry... Like GroundHog Day, it all started again the next morning. While college primed the caffeine engine, veterinary school followed by the rotating internship, specialty internship and residency continued to grease the wheels. 20 hour days, on-call shifts, and the constant pressure to remain above the curve were fueled by caffeine. Even after achieving my goal of board certification, the pressure to perform remains. A 7am shift for this Type-A veterinarian starts by SOAPing my patients at 5:30am. A 24-ounce WaWa hazelnut coffee in hand and a 1-Liter Diet Coke in the bag. I open my laptop next to the work computer and play Taylor Swift's latest money maker (yes...figured while I am being this open, why not just tell the truth. I love you Tay-Tay). There is nothing like catchy pop music (and my 24 ounce caffeinated compadre) to get the heart pumping! 1.5 hours later, my shift actually starts at 7am. Patients are SOAPd, incoming cases start rolling in, and phone calls to owners are made with patient updates. (I am told it is frowned upon to call Fluffy's Mom for an update at 5:45am). 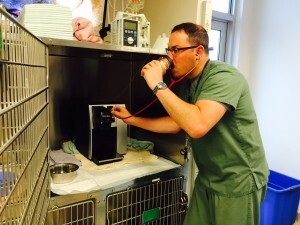 If you have not already seen our blog on how to be a more efficient veterinarian, you should! I know I am not alone. Like most veterinarians and veterinary technicians out there, I was always considered to be smart, driven, and have pushed myself from an early age to succeed. I, like most, am a type A+++ personality. This doesn't go away overnight. For me, it will never go away. While it will not go away, it must be balanced. Without balance there is fizzle. Career fizzle. Enthusiasm fizzle. Life fizzle. 1. Make an effort to prioritize time with others. Spouse, family, and friends, etc. 2. Learn to say “No!” I can’t do it all. I always feel badly when I say "No." But what was the most interesting thing is that people don't get mad. They actually have told me...I am glad you declined. I was worried you were taking on too much. 3. Take time to plan and take vacations. Even if 6 months in the future, it is something to look forward to. 4. Enjoy a mindless task. Whether it is watching ESPN, a silly sitcom, or a jog outside, do something to clear your mind. 5. Make sure you have a good support system, both in and out of work. Guess what, you are not the only one stressed at work! Your co-workers feel the same. Finally, know that there are trained professionals out there (social workers, psychologist/psychiatrist, etc.) that are there for you. In fact, VETgirl has an upcoming webinar on stressful situations at work and emotional emergencies! While I will never break the caffeine habit completely, I have more balance in life. Do you have a caffeine habit? Stress management tips? COMMENT below and let us know your story!